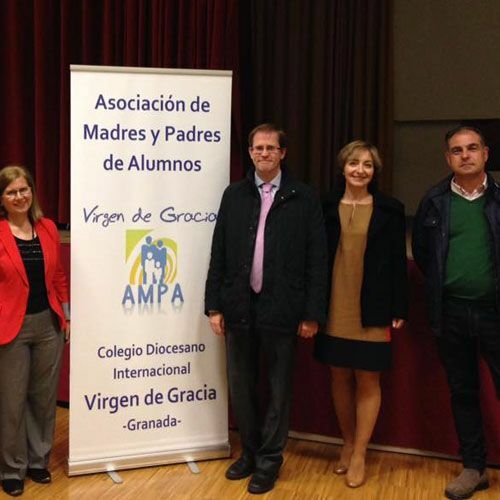 AMPA (Association of Mothers and Fathers of Pupils of the Virgen de Gracia School) is a non-profit association that, with the aim of keeping the school in constant growth, collaborates with us carrying out various actions and activities. Formed by the parents of the students of the school, the AMPA offers to represent the families before the direction and the teachers of the school. How can AMPA help you? AMPA acts as a channel of communication between the parents and the School. It offers activities to complement the training of students.It guides parents in the educational background of their children and they participate in the educational task of our School. AMPA coordinates a Commission to make structural improvements in the School. To the extent possible, they offer financial support to improve the infrastructures and facilities of the School. It guides parents in the educational background of their children and they participate in the educational task of our School. The Association of Mothers and Parents of Pupils of the school collaborates in multitude of actions to support the educational background of the students. Offering educational support to the school is one of AMPA’s objectives as an association. The holding of conferences in which to educate both the children and the parents. Internet and social networks Where does my child surf? Psychology: My son depends on the mobile. What can I do? Who is part of AMPA? How can I participate in the AMPA of the International Diocesan School Virgen de Gracia? If you want to participate actively with the AMPA, to make our school improve day by day thanks to the generosity and kindness of parents, you can fill out this form. In it you will have all the information to join the AMPA of the school. The Association of Mothers and Fathers of Pupils of the Virgen de Gracia School has the task of EDUCATING ALL TOGETHER.